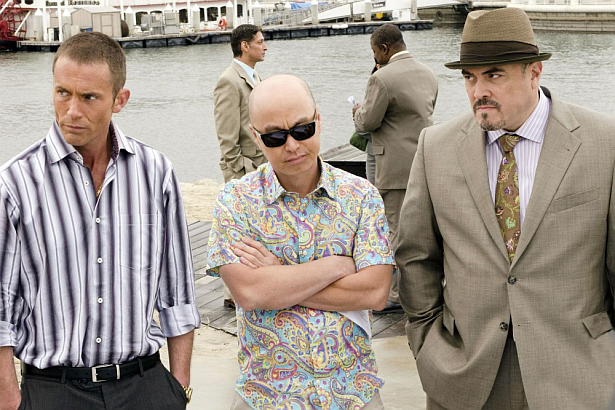 EW has some details from the Miami Metro Team of Dexter, David Zayas, C.S. Lee and James Remar about their characters in the upcoming final season. Hit the jump to get all the scoop! What does the final season of Showtime’s Dexter hold for the intrepid Miami Metro team? First, there’s a new “Big Bad” this season dubbed The Brain Surgeon (he removes little pieces of his victim’s brains, you see). Plus, there’s the matter of Capt. Maria LaGuerta’s death in last season’s finale at the hands of Debra. That storyline initially takes a backseat since Miami Metro thinks it’s a closed case and doesn’t realize Deb and Dex were involved. But somehow we suspect her case won’t remain shut all season. Here’s some relatively spoiler-free (this is what you learn at the start of the season) teases from Dexter‘s supporting players.